The chart below is on I drew up on May 3rd. * I was going to get a fresh chart and put my analysis on it but to be honest my price forecast/analysis has been spot on thus far and there is no need to update. Well, this week we had been watching NUGT ETF for days waiting for the right pullback. Besides all the contrarian elements of the hated Gold Stock sector, we liked the On Balance Volume bullish divergence on the chart. *So we sent the chart below to our subscribers and told them to buy from 8.80-9.30 roughly, and the ETF opened at 9.15. We had opportunity to scale from 8.80-9.15 most of the morning, then just 1 full day later we are at $10.12, up 12.8% already and still long as of this post anyways. (We alert our subs when to sell as well). Using 8.80-9.15 average we get a scale entry of 8.97 per share on NUGT. *We often take profits quickly, but in this case we think there could be a good run, so we will monitor and hold for max returns as market dictates. IOC- We entered at 79.50-80.00 this week after the pullback from 106 spike highs last week. We exited today with an alert sent out at 88.80 per share, up 10-11%. The stock now trades at 83.50. We were concerned about the market having a further correction and we like to take profits. Timing stock market tops and bottoms is risky business and we all know the more the more risk we take the more potential gain would could also made. Correctly timing a top or bottom for any investment is flat out exciting not to mention financially rewarding. But this high risk trading tactic does come with some major issues which you must FULLY understand so that you can protect your capital and self-confidence. On May 13th I wrote a special report on how to spot market tops just before they happen and how to do it with a very high probability of success. I also explain the major pit falls to be aware of so you stay on the right side of the market. That special report truly showed you what was going to happen a few weeks before it did. Much like how this report shows you what is likely to happen in June. Looking at the market with my YOU ARE HERE type of using cycles, volume, price patterns and momentum to forecast what is likely to unfold in the coming weeks. Depending on the time frame used for my analysis I can figure out with a high probability where price will be in a few minutes, hours or days also. Stock market tops are tough to trade and time. That is because there are so many things happening in the media and emotions running wild that it’s tough to get a grasp on what you should really be focusing on to keep a level head trade around it. Market tops are typically not an event but rather a progression that takes much longer than most individuals expect. I still find myself jumping the gun at times and I know this and have been through this process hundreds of times in various investments. The human brain is a powerful tool but emotions can force you to override your rules/strategy still. It does not matter where you go to get your stock market news and reports… Everyone is arguing their bullish or bearish case more than EVERY. 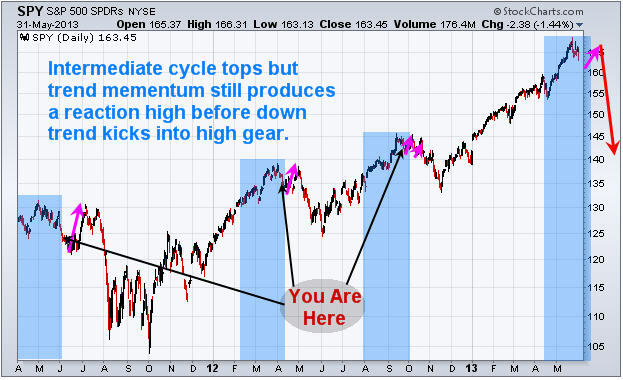 There is a reason for this and it’s because the SP500, DJIA, RUT and NASDAQ appear to be entering a cycle top. What does this mean? It means the uptrend is almost over from a technical analyst point of view, and those who are have been bearish for a long time feel the market topping out more now than ever in their gut that this is the top. Keeping it simple removing news, economic data, emotions and biases we are left with one thing which is technical analysis. This is based on price alone and that is important to remember because the only thing that pays you money for an investment is when price moves in your favor. Believe it or not price only has blips on the charts here and there which is based off news, economic data etc… In the big picture stock prices tend to lead economic data by several months and in some cases years. So the big question is this… If price action is the only thing that pays you when trading why bother worrying about all the other opinions, news out there. That stuff only adds to the confusion and in most cases gets you on the wrong side of the market. In short, from a technical point of view the SP500 remains in an uptrend. But according to technical analysis the upside momentum is starting to slow. If we get a few more down days then the trend will flip and be down but it has not yet happened. When the trend does reverse down you must remember that 80% of the time price will bounce back up to test near the recent highs before truly rolling over and collapsing. Think of it like a zombie movie. Just when you think you killed one it comes back to life for one last scare before its dead. Just to touch on stock market bottoms so you do not get confused. Stock market bottoms are little different than tops so they are traded differently. I will cover them when the time comes. 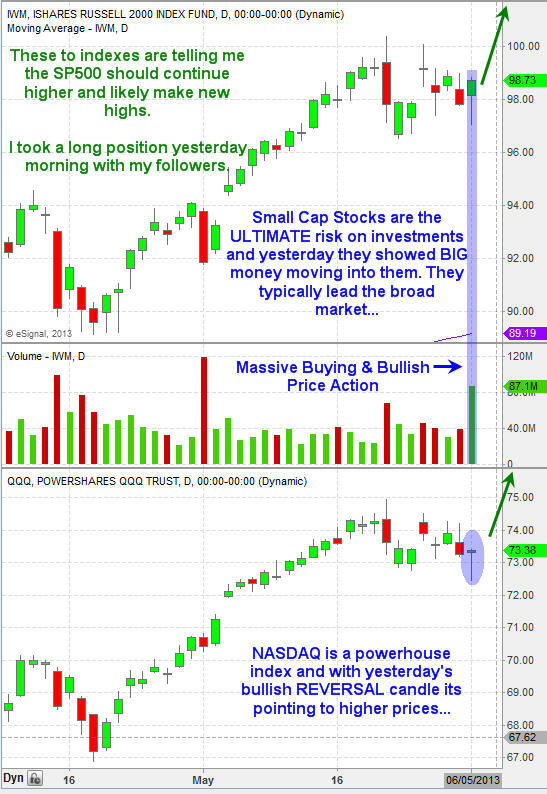 Trading the market is not easy during this type of condition, which is why members and myself got long SSO on the 23rd and two days later sold out for a 3.5% gain. I am now looking to reload this week for another bounce/rally play but only time will tell if we get another setup. After a long holiday weekend, Wall Street got off to a relatively good start this week, with the Dow Jones Industrial Average finishing higher for the 20th straight Tuesday. In economic news, investors welcomed better-than-expected housing and consumer confidence data;*the S&P Case-Shiller 20-City home price index rose 10.39% for March, while*the Conference Board’s Consumer Confidence Index for May also topped analysts’ expectations, jumping to a five-year high of 76.2. Meanwhile, investors shifted their attention to the high-yielding corners of the market, which have recently suffered as Treasury yields skyrocket to levels not seen in over 13 months. In this article, David Templeton takes a close look at the relationship between stocks, bonds and the central bank’s stimulus measures, highlighting how modern portfolio theory has played out in the current market environment. Though precious metals have taken a beating so far this year, Chris Vermeulen thinks both precious metals and miners may be finally bottoming out. 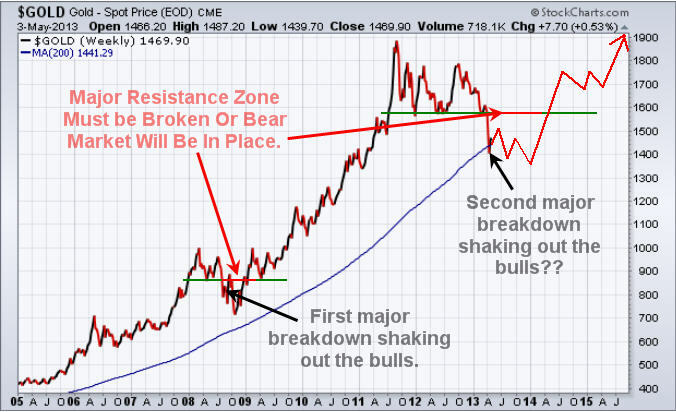 In this article, Vermeulen gives us his technical analysis of gold, silver and the Market Vectors Gold Miners ETF* (GDX, B). In this short and insightful piece, Matt Phillips discusses the key housing trends seen in recent years, highlighting several charts that investors should be paying close attention to. On Tuesday, yields on the 10-year note rose to their highest level in more than 13 months. This article, written by Doug Short, discusses U.S. Treasuries’ recent price movements as well as a historical look at yields over the years the Fed implemented QE. In recent sessions, investors have witnessed Tesla’s (TSLA) meteoric rise, making many understandbly leery of the share’s recent rally. In this piece, Joe from UpsideTrader discusses his take on the stock, highlighting where he thinks Tesla may be headed next. In this article, Frances Coppola highlights a key topic that has gotten significant attention since the Fed started its stimulus measures: inflation. In this insightful piece, Corey Rosenbloom gives us his analysis of the utilities and consumer staples sectors, highlighting recent trends seen in the Utilities Select Sector SPDR ETF* (XLU, A) and the Consumer Staples Select Sector SPDR ETF (XLP, A+). Yet again, our ATP reversal method nailed 7.5% gains in 24 hours this week during a choppy market. *Just in the past few weeks we have consistently hit at least one stock a week for 7.2-9% gains inside of 48 hours. Our latest was alerted on June 3rd in the morning to buy SEAS on the pullback. We specifically instructed our traders to buy from 34.15-34.60 only and wait for the pullback to buy. The stock pulled back to 34.17 and we again sent an E-mail alert reminding our traders to position long. The stock had pulled back from near 39 and we watched and then pounced. Well timed aggression is what we do. The stock had filled a few gaps in the chart and then we entered over a few hours. Using a high average of 34.52 per share, we booked 7.5% gains today by sending an alert to sell at 37.20 per share. 24 hours, 7.5%…. on to the next one. Over the past couple week’s investors and traders have been growing increasingly bearish for the US stock market. While I too also feel this rally is getting long in the teeth there is no reason to exit long positions and start shorting. My followers know I do not pick tops and I do not pick bottoms. This I explained in great detail in my previous report. There are more cons to that tactic and on several different levels (timing, volatility, emotions, lack of experience, addiction) than there are pro’s. 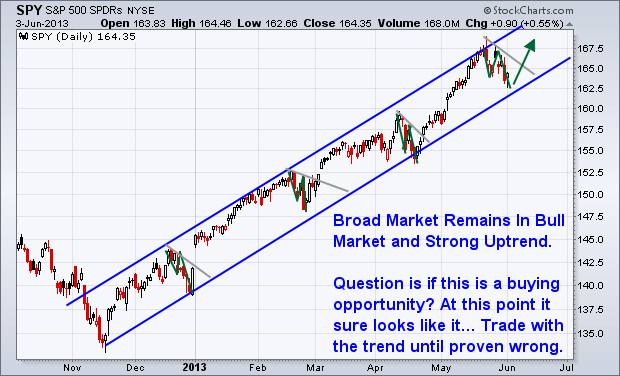 Keeping things simple, short and to the point here is my thinking for today and this week on the broad market. Remember my analysis is 100% technical based using price, volume, cycles, volatility, momentum and sentiment. I try not to let any emotions, gut feel, or bias flow into my projections. I say “TRY” because I am only human and at times when the market and emotions are flying high they still take control of me but that is few and far between. So let’s get to the charts shall we! The charts below show and explain my thinking… But in short we need these two indexes to be strong if we want to see another major leg higher in the SPY, or to at least test the recent highs. Today the market opened slightly higher and push up in the first 30 minutes with strong volume. Overall the market looks as though it needs a day pause/pullback before taking another run higher. The SP500 has been very predictable the past couple weeks for both intraday trading during key reversal times in the market when price has pullback to a support zone, and also for swing trading. Last week we myself and followers bought SSO ETF when the market pulled back and we exited the next day for a 3.5% profit. Yesterday was a perfect intraday example with the SP500 bottoming out at my 11:30am morning reversal time zone with price trading at support. Price then rallied into the close posting a 12 point gain on the SP500 futures for a simple momentum play pocketing $600. In short, I still like stocks as the place to be and will not get bearish until proven wrong. Once price reverses and the technical clearly paint a bearish picture with price, volume, momentum, cycles and sentiment will I start shorting the bounces. This week is a pivotal one for the stock market so expect increased volatility and possibly lower lows still until the counter-trend flushes the weak position out before moving higher. It has been a very long couple of years for the precious metal bugs. The price of gold, silver and their related mining stocks have bucked the broad market up trend and instead have been sinking to the bottom in terms of performance. Earlier this week I posted a detailed report on the broad stock market and how it looks as though it‘s uptrend will be coming to an end sooner than later. 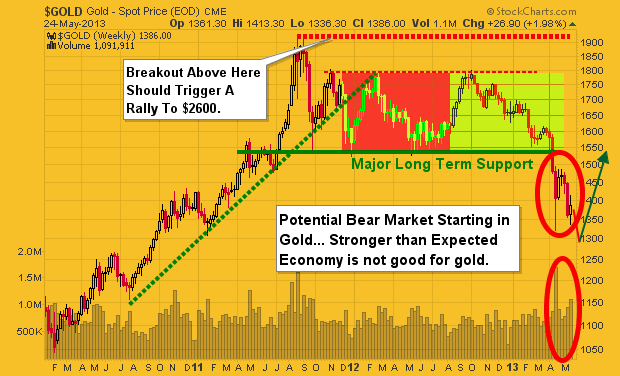 The good news is that precious metals have the exact flip side of that outlook. They appear to be bottoming as they churn at support zones. While metals and miners remain in a down trend it is important to recognize and prepare for a reversal in the coming weeks or months. Let’s take a look at the charts for a visual of where price is currently trading along with my analysis overlaid. 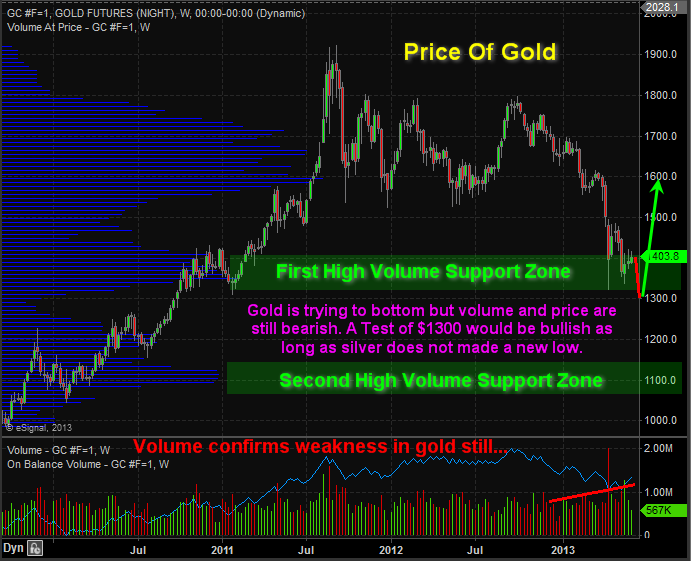 Gold has been under heavy selling pressure this year and it still may not be over. The technical patterns on the chart show continued weakness down to the $1300USD per once which would cleanse the market of remaining long positions before price rockets towards $1600+ per ounce. There is a second major support zone drawn on the chart which is a worst case scenario. But this would likely on happen if US equities start another major leg higher and rally through the summer. 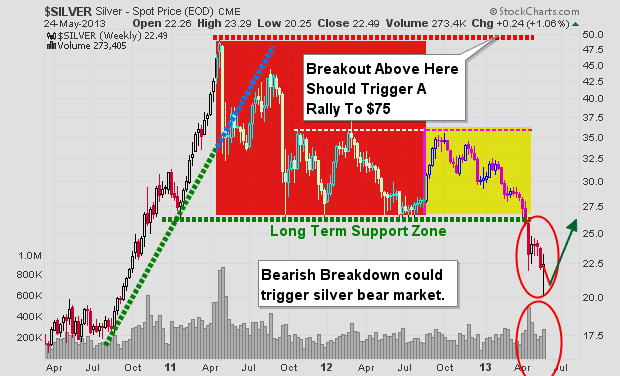 Silver is a little different than gold in terms of where it stands from a technical analysis point of view. The recent 10% dip in price which shows on the chart as a long lower candle stick wick took place on very light volume. 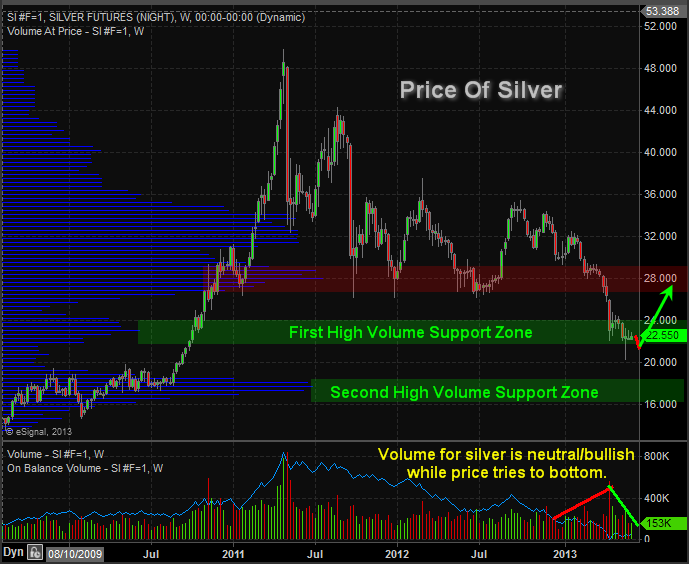 This to me shows the majority of weak positions have been shaken out of silver. Gold has not done this yet and it typically happens before a bottom is put in. While I figure gold will make one more minor new low, silver I feel will drift sideways to lower during until gold works the bugs out of the chart. 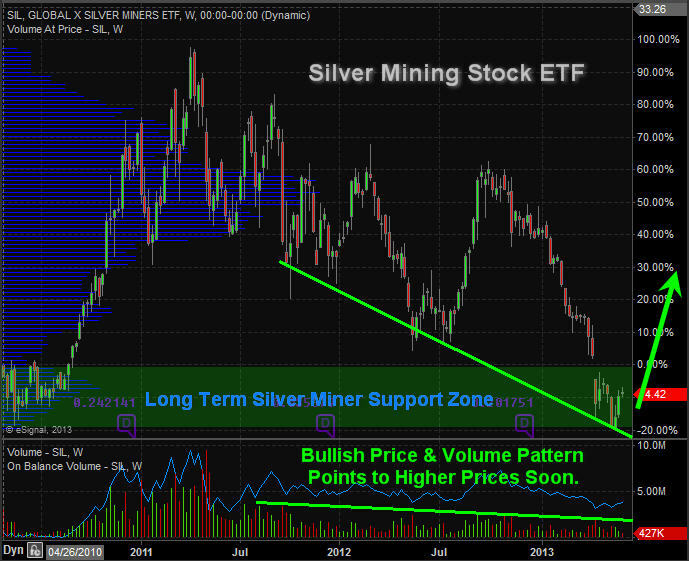 Silver miners are oversold and trading at both horizontal support and its down support trendline. Volume remains light meaning traders and investors are not that interested in them down where and it should just be a matter of time (weeks/months) before they build a basing pattern and start to rally. 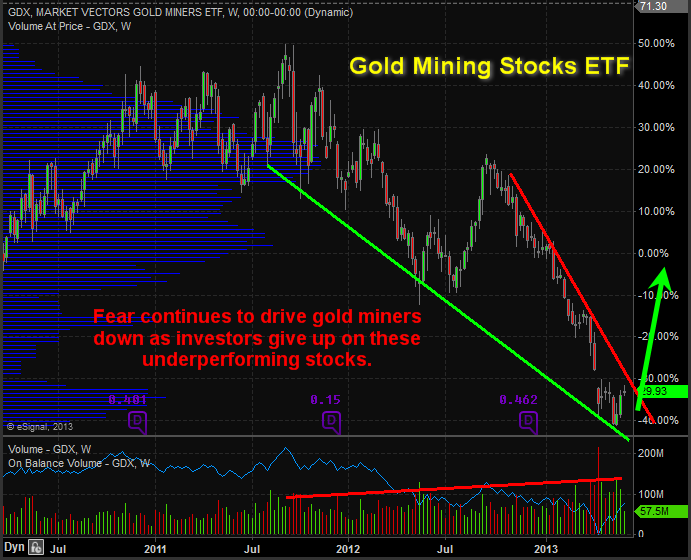 Gold mining stocks continue to be sold by investors with volume rising and price falls. Fear remains in control but that may not last much longer. 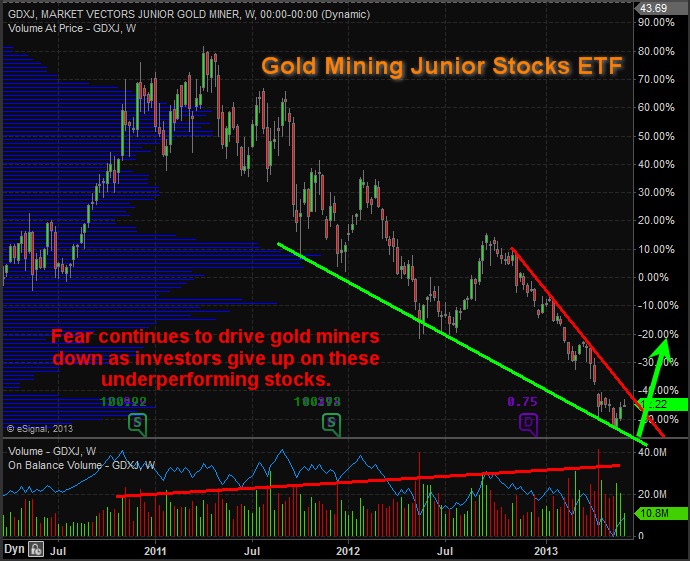 Gold junior miners are in the same boat with the big boys. Overall gold and gold miners are still being sold while silver and silver stocks are firming up. 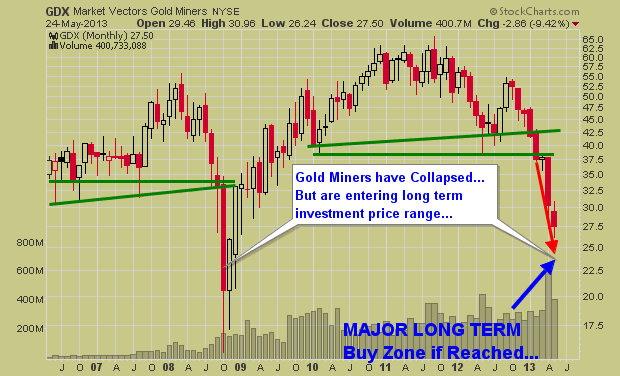 In the coming weeks we should see the broad stock market top out and for gold miners along with precious metals bottom. There are some decent gains to be had in this sector for the second half of the year but it will remain very dicey at best. If selling in the broad market becomes intense and triggers a full blown bear market money will be pulled out of most investments as cash is king. Gold is likely to hold up the best in terms of percentage points but mining stocks will get sucked down along with all other stocks for a period of time. This scenario is not likely to be of any issue for a few months yet but it’s something to remember. Over a week ago we hit NUGT (Gold Stock 3x ETF) for 24% blended return in 48 hours doing the same, and the week prior UGAZ (Natural Gas 3x ETF) for 7.4% in 48 hours as well. We try to find about 1 per week, sometimes more. This week we entered the TNA ETF (3x Long Small Caps) on June 5th as the market had continued its 2 week dive. We knew there was a 38% fibonacci pivot being hit from the recent market highs, and we thought that as a wave 4 pattern (Elliott Waves) we should go to the long side of the market as everyone was selling out. We closed out TNA for 4.6% plus gains today and some ATP traders close to 6% if their entry was lower than the high average we are using (46.70). 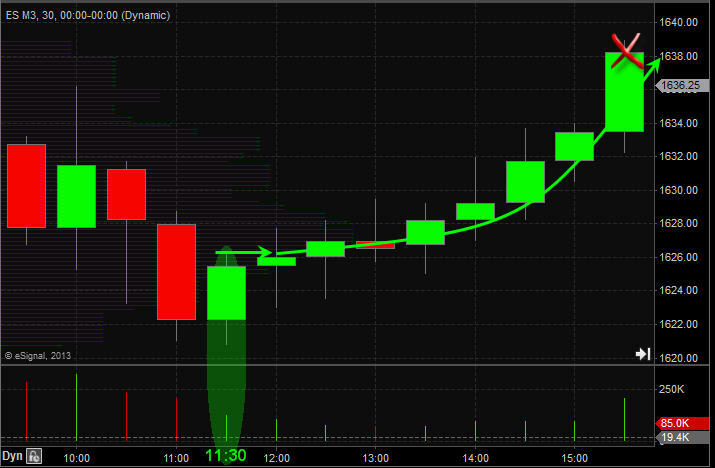 Our alert was to buy from 46-47 on the TNA ETF, and it traded after our alert between 45.70 and 47. If you picked it up with an average closer to 46 your gains were that much better. We always try to scale into our trades on pullbacks in the first 24 hour window. Either way, a 4.6% swing gain in 24 hours works for us and we don’t try to pretend we will hit the exact high, we just take the meat off the bone and leave the scraps for the vultures. Being a “Contrarian Trader” doesnt meant you are projecting 12 months out from now that a sector may turn around. You can actually identify shorter term intermediate bottoms in sectors, commodities like Coal, Natty Gas, Gold etc and then play off of those patterns. At ATP we look for crowd behavioral patterns that are common and repeated throughout history and all market cycles, and then we exploit them with well timed aggression. This morning on Stocktwits.com our followed saw our tweet that UNG (Natty Gas ETF) was bottoming in an ABC pattern, and therefore the contrarian trades were WLT, ANR and so forth. At the time of our tweet it was 10 am EST. *WLT was at $14.80 and falling. 30 minutes later as Natty Gas turned up from the ABC bottom we identified (Over few weeks of pattern time) , WLT was up 5% in 1/2 hour. Although this could be called a “Day Trade”, it still gives you an idea of how we think for swing trades as well. *About two weeks ago we identified a pattern bottom in GDX ETF, so we went long NUGT and pocketed 24% blended gains in 48 hours.